This Freddie King style phrase is quite simple, but the wide bends and occasionally staccato delivery require a great deal of commitment in their delivery. It’s slightly dissonant over the G major chord in the background, but that’s deliberate! 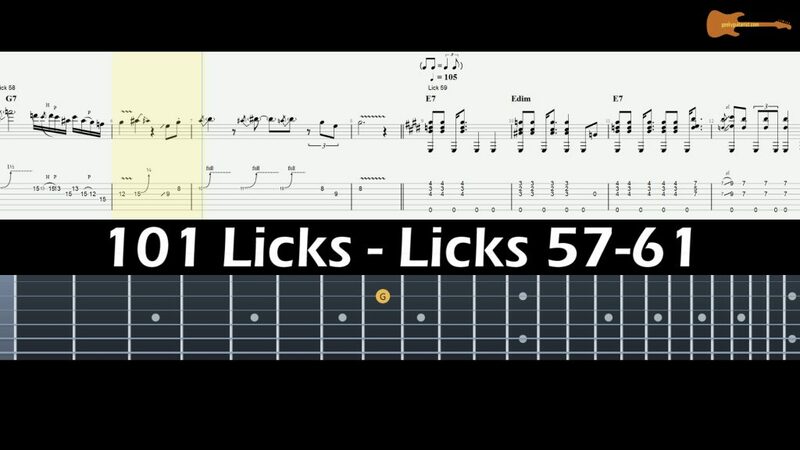 A slightly busier alternate take on the previous lick with a more legato feel, this example changes position for the second two bars. Again, be sure to pitch the wide bends correctly and remember, as so often is the case with blues, it’s all in the delivery! This Robert Johnson style idea is played fingerstyle, palm muting the bass notes for a more percussive effect. The bass steps into a different groove for a moment in bar 4, so beware! Otherwise, it’s a case of taking your time until it falls into place. Using the picking hand thumb for the bass notes and the first finger to ‘flick’ the chords with up and downstrokes, we see the unusual harmony produced when combining a chromatic descending run with a major chord. It’s tricky at first, but the old adage of ‘practice makes perfect’ definitely applies here. Sixths sound great going down as well as up. Notice how we join up the two minor sixths chromatically, so we get the same shape played on three consecutive frets. Sliding the sixths rather than picking each note every time makes it seem much slicker too.